Pink Fish is a new fast-casual seafood concept where Norwegian salmon is the star of the show. Here, RLI sits down with company CEO Ronny Gjøse to learn more about the company and discuss the ambitious expansion plans the brand has in store for the next decade. Founded by award-winning chef and Bocuse d’Or winner Geir Skeie, Svein Sandvik and Ronny Gjøse, the idea behind Pink Fish is to bring fresh Norwegian salmon to people all over the world. The founders imagined a vibrant menu of salmon dishes, packed with delicious international flavours and served to order – fast. After opening its first restaurant in November 2017, the company has grown to operate five units and has a good mix and spread on high streets and in urban shopping malls. Two more restaurants are in the pipeline to open in April and May; one is Stavanger Airport Sola whilst the other is at the new Munch Brygge area, close to the upcoming MUNCH museum that will be opened in summer 2020. “The last year has been a really exciting ride for us. We were slightly optimistic when we said we would open our first international restaurant in early 2019. So when we do deliver on this promise, and in such a fantastic location as Jewel in Singapore which will be a unique and truly iconic building and venue, it shows that our concept is growing internationally,” explains Pink Fish CEO Ronny Gjøse. The two most recent restaurant openings were Pink Fish at Oslo City, and Pink Fish Storo. The unit in Oslo City is situated in the most urban mall in Oslo with the highest footfall and the unit was specially designed as an “express” unit that can handle people on the move. The other store in Storo is the company’s first standalone neighbourhood restaurant, and also Pink Fish’s largest at approximately 200sqm. “We see this restaurant as a good alternative when people are going to the cinema, but also for students at the nearby universities, and of course young residents that are interested in healthy and tasty seafood dishes that are served quickly in a unique environment,” says Gjøse. In the coming 12 months the company is looking to work more on its branding and marketing, whilst continuing to grow top-line and ensure profitability in its Norwegian restaurants. “Pink Fish is the world’s first fast casual seafood concept based on Norwegian premium salmon, and to grow and make the concept top of mind to potential customers does take time as they are so used to eating the well-established fast food such as burgers, pizza and pasta,” Gjøse explains. 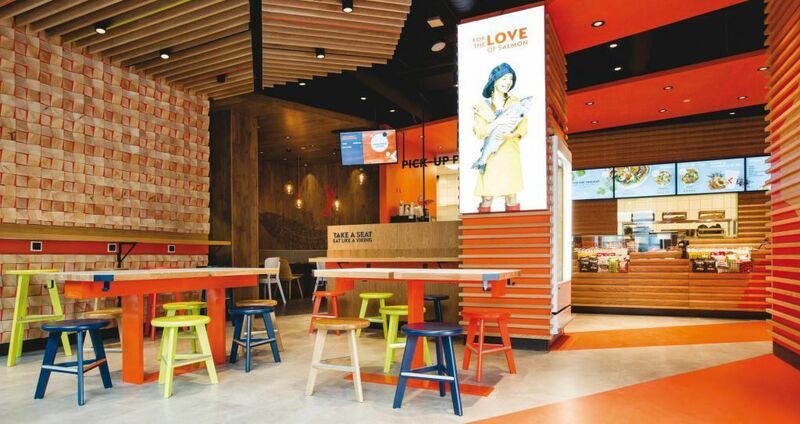 The brand is also looking to secure its Asian operations in Singapore and make the necessary local adaptions so that the concept is a success in Asia so they can secure some good franchise partners who have the operational experience and financial strengths to grow the concept in designated regions in close collaboration with Pink Fish. 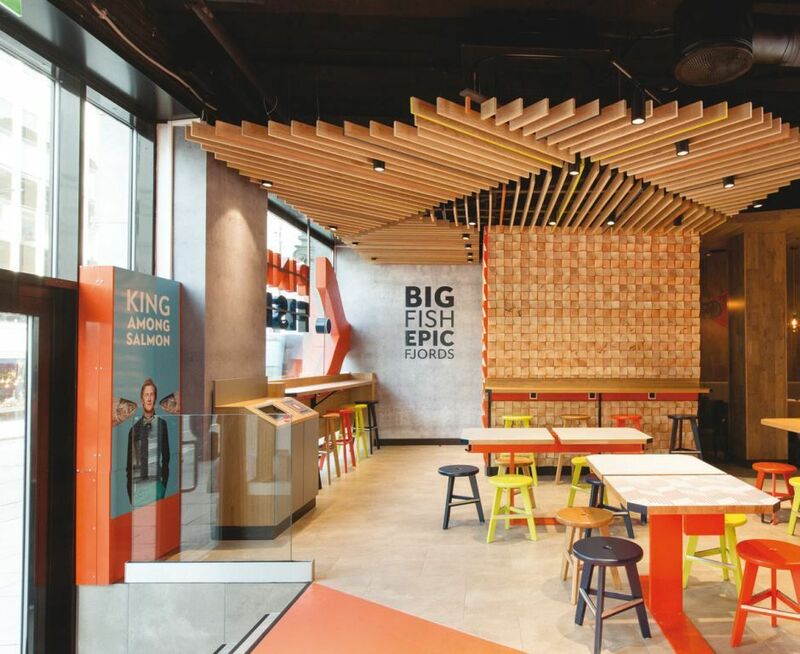 “Our goal is to open the first franchise restaurants in Q4 or early 2020, and to then speed up our restaurant openings to achieve our target of being a well-known international brand with 1,000 restaurants by 2027,” says Gjøse. Company founders Skeie, Sandvik and Gjøse have used their skills and knowledge to both develop Pink Fish, but also a system on how to maintain the brand and when to develop new dishes to update the menu. They have incorporated a strict system that they use twice a year over a six-week period where they analyse sales, customer feedback and trends in the market and based on this, they make the necessary changes. Social media channels are very important for the brand as it looks to build its international store count, and the company’s ads are now placed on Instagram and Facebook. Pink Fish’s marketing manager is specialised on social media channels and is very hands on, but the founders also work closely with some specialists around influencers and 360-degree marketing campaigns. What makes Pink Fish different from other restaurants is the fact that its core ingredient, salmon, is traceable from egg to the restaurant, and is of the highest standard and ACE certified, that its packaging is compostable and does not incorporate the use of any plastic, and that its fast casual concept is unique but simple, and the customers can embrace that they can eat modern and cool seafood dishes in a simple and easy way, made to order, at an affordable price. “Looking forward, the greatest challenge is to build the brand and make it more visible and get more customers aware of the concept. We’re on our way and are building stone by stone,” comments Gjøse. “We are excited to continue to show all the exciting flavours you can pair with Norwegian salmon, and we love challenging established truths about how seafood can be used. We are happy to share our recipes and to show people just how easy it is,” he concludes.